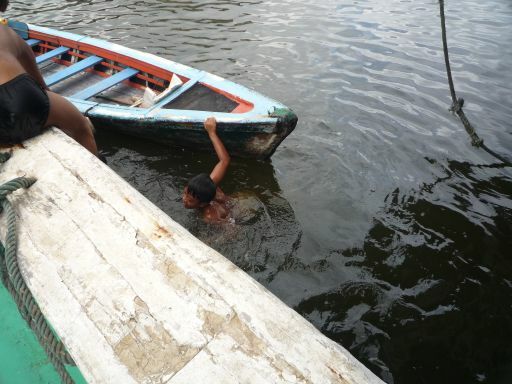 This was an ad-hoc trip. 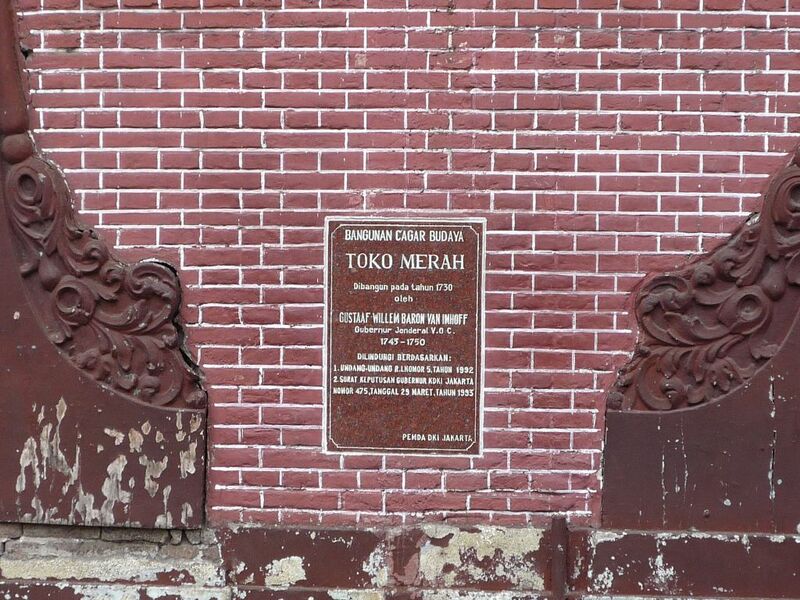 We were supposed to go to Yogyakarta last November, but had to defer the trip due to the Merapi eruption. We were given a credit shell, and Jakarta was the most viable option in terms of cost. In fact, we still had credit balance to make the trip to Yogyakarta. 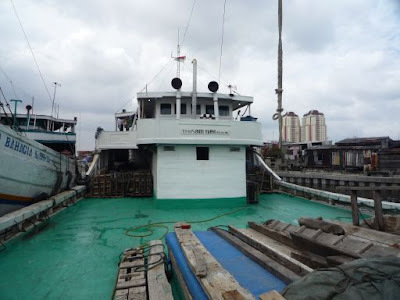 We would head to Solo though this time around, in February, as it was much cheaper. When we reached Kota Tua Jakarta, we took some photos of the Batavia hotel, then proceeded to Taman Fatahillah or Fatahillah Square. 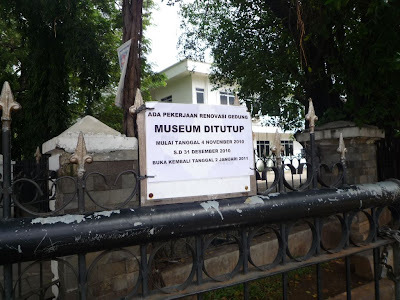 Unfortunately, we couldn't get into the Jakarta History Museum (or Fatahillah or Batavia museum) as it was closed for renovation. 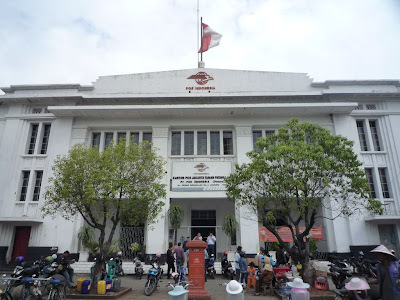 It was previously the town hall of Batavia which houses the office of the Governor General of the VOC (Vereenigde Oost-Indische Compagnie or the Dutch East India Company). We then went to look around the square – there was the historical Fatahillah Post Office (Kantor Pos), which is still in use. There was a classic red post box – called Brivenbus in Dutch. We thought of posting a card back to Malaysia, but then I guess we forgot to do it. 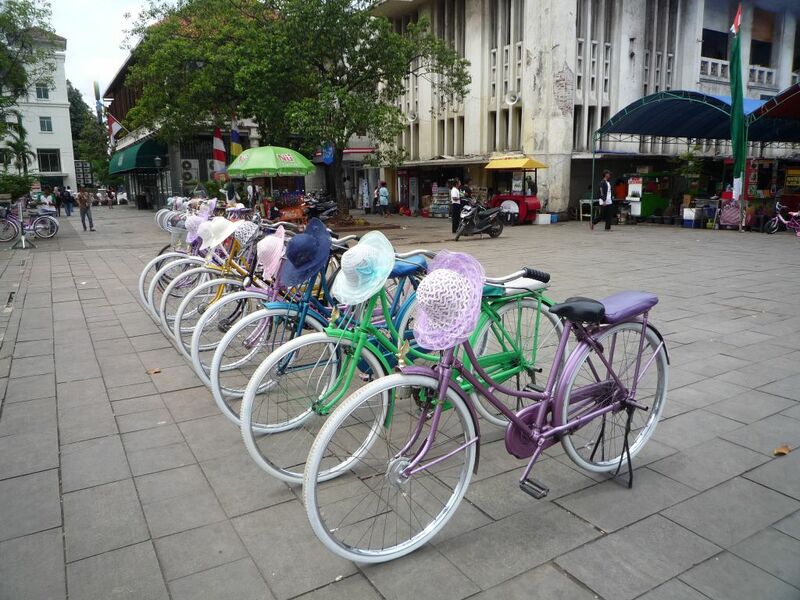 Our attention was diverted to the bicycles neatly lined up with cute matching hats in front of the post office. On closer inspection, we found out that these bicycles (or sepeda) are offered as part of the Kota Tua tour, cycling around the old city with a guide leading us. Sweet! 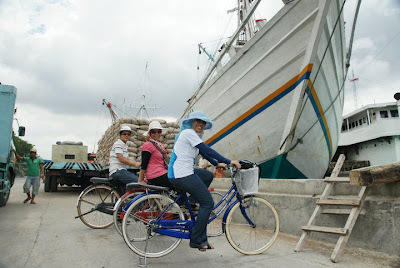 We agreed to take the tour without much thought ;-) It only cost us IDR 40,000/person or RM14/person. It was not an easy task to navigate the busy roads of Old Jakarta with the bicycles. 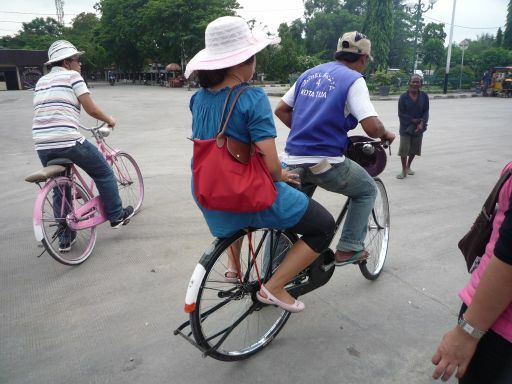 At busy intersections with no traffic lights, our guide had to serve as a traffic police as well. Phew! It was a close call. Actually, you have to be confident to cross to the other side. Vehicles will give way if you just raise your hand to cross over. When Razeif and the guide came back, we made our way to the observation tower or Menara Syahbandar. We didn't go into the tower, just made a short stop. 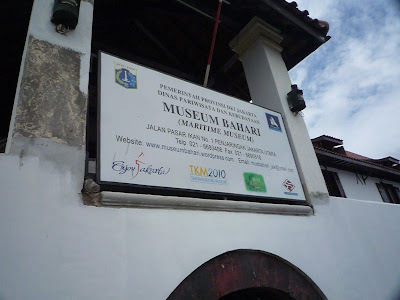 We then walked to the nearby Maritime Museum (or Museum Bahari). 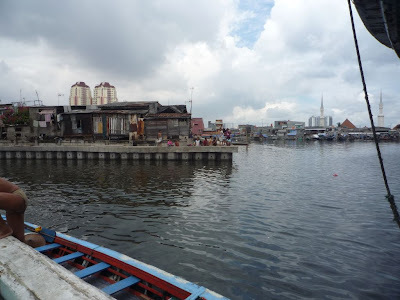 On the way to the museum, we passed by some shops selling traditional / local produces such as mortar and pestle (lesung batu) and steel pots at the Pasar Ikan Luar Batang area. The museum is also still under renovation. 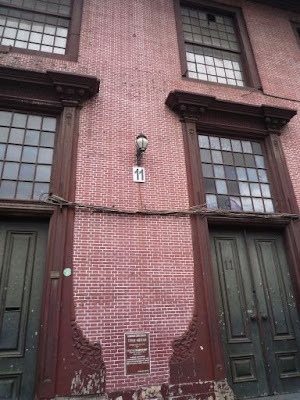 It was previously a warehouse storing spices during the Dutch era. 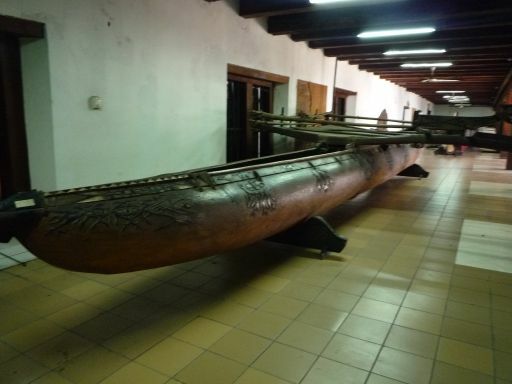 The museum now houses some replica of boats used during the old days. 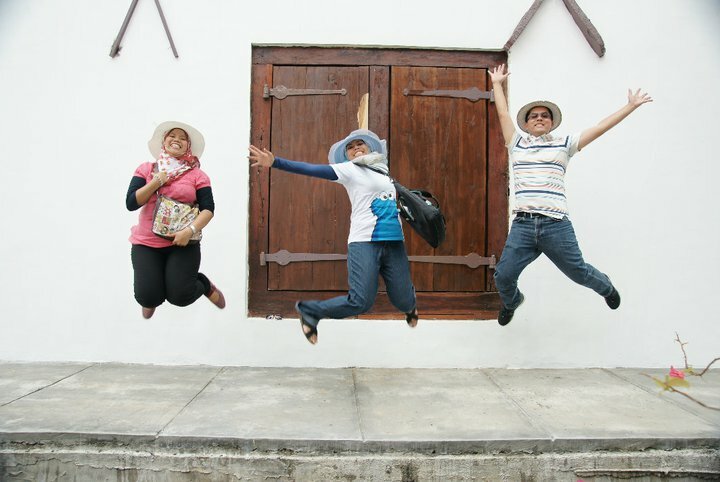 As usual, it wouldn't be complete without our obligatory jumping shots! 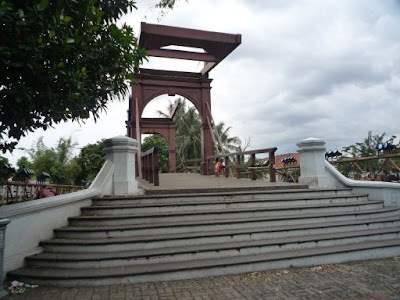 Next we cycled to the Kota Intan drawbridge, took some pictures, then proceeded to the Batavia Hotel area which we had just taken some pictures before we took the cycle tour. 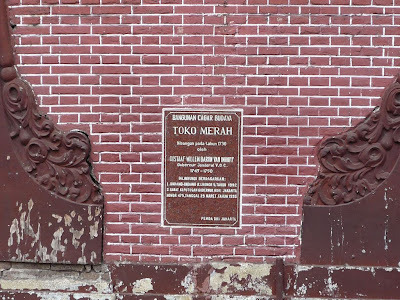 Then we went to Toko Merah which was the house of the Governor General of VOC from 1745 – 1750. After that it was back to base where we were re-united with Mas. Pak Dodi then suggested that we move straightaway to Bandung to beat the impending traffic jam (macet) and had Nasi Padang Sederhana (this is the name of the restaurant) lunch at the R&R. Before we went off, we all had an ice cream each as our stomachs were already growling by then. 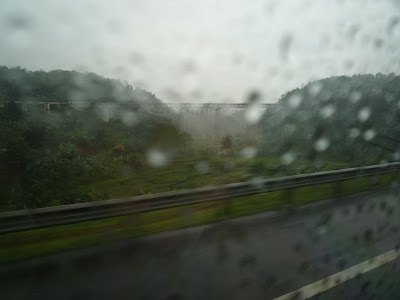 Now there is a highway to connect Jakarta and Bandung which had cut short the journey down to 2 hours. Hence the traffic jam at Bandung as it was a Saturday, so it was a weekend getaway for the city folks to wind down or shop at Bandung. Last time I went to Bandung in the 1990s, we had to take the trunk road, so it took longer to arrive. But the good thing was- there was no traffic jam back then. 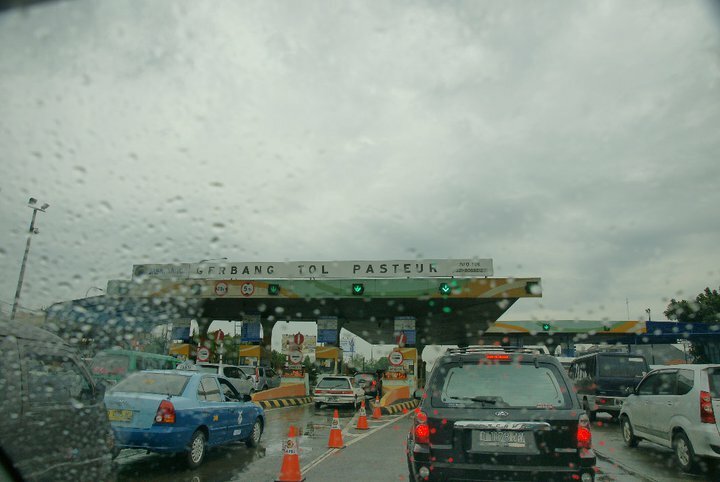 With the highway, we would be bypassing Puncak and Bogor and head straightaway to Bandung. It was drizzling when we arrived at Bandung. And it was already jam packed at Pasteur toll gate. 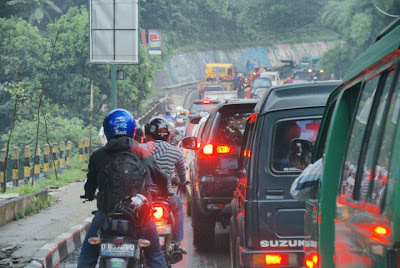 We were crawling bumper to bumper to reach Bandung city. 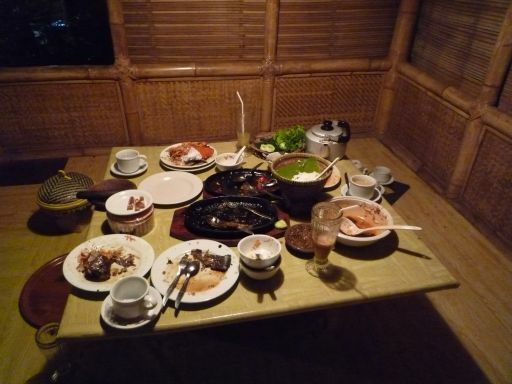 We decided to go to Factory Outlets (FO) and have dinner, then only check in at Arwiga Hotel . 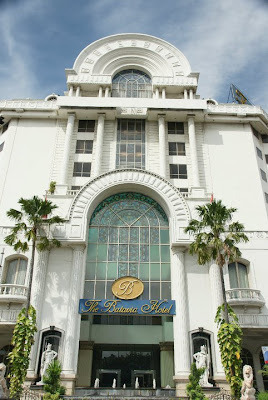 We haven't paid the deposit for the hotel (only phone booked), so Pak Dodi called the hotel to confirm our arrival. At the FO, the gang got some jeans / clothes for themselves and their loved ones, while I was being more picky, so I still couldn't find something to my liking. We went to Grande and Central Fashion at Dago area. We then went to the spa for massage (I forgot the name of the spa). Razeif and Liza took the 2 hour Kenanga massage while Mas took the 1 hour manicure and pedicure. Yours truly was feeling very hungry so she went to McD instead and tapau-ed herself a Cheeseburger LOL! She then continued on her quest to find the perfect jeans at Jalan Setiabudi area and found one at an FO near to Rumah Mode. Not sure whether it is an original or not, but it felt comfy ;-) I did check out Rumah Mode too- it was packed, many of them Malaysians :-p Branded garments are sold here at a slightly lower price. After that, we were re-united. Then we went to the Saripowon restaurant to have dinner at 9pm WIB (10 pm M'sian time)! 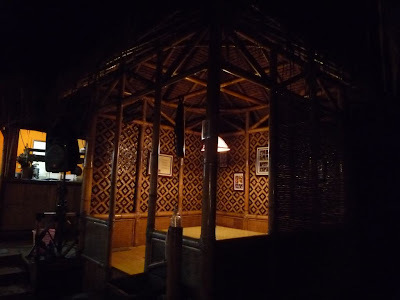 We were seated (duduk bersila or lesehan) at the huts. 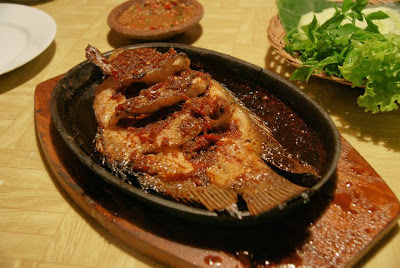 We ordered ikan gurame bakar and Mas ordered her favourite crab (or kepiting). I don't know how to eat crabs lol! I just watched ;-) By the time we finished, we were the only customer left there. 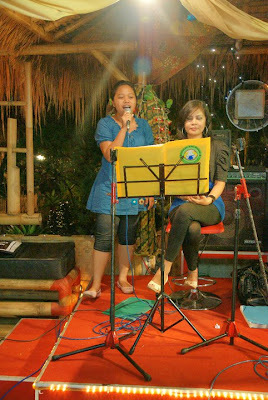 There was a live singing, and the lady singer invited us to sing up front. Since there was no one else there, Mas took the opportunity to sing! 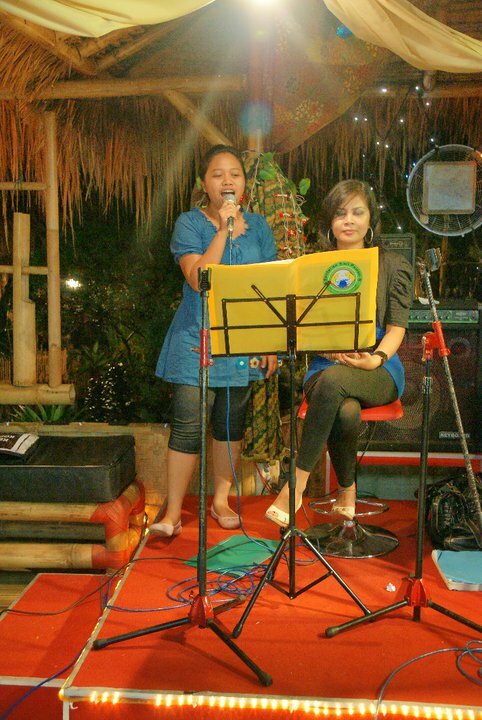 And it was recorded by the owner of the restaurant. He promised to post it on his Facebook. Mas would be famous now! Full and happy, we were now ready to hit the sack. We checked into Arwiga Hotel at almost midnight. All we wanted to do was to have a good rest. Lo and behold, the sight of our standard room shocked us. I admit, the room only cost IDR 280K (RM97), but we could get a much better room with the same rate at Krabi. But then maybe we shouldn't compare with a totally different place. We didn't take any photos of the room as we were too shocked of the condition, it looked damp and creepy. It was a basement room. It was very tiny, just enough room for 2 single beds and a mattress (yes, we booked for an extra bed, but we were only given a mattress – an extra bed wouldn't fit in!) At first I didn't want to think much about it as it was only just a few hours to sleep over then we could check out early next morning. I took a shower, then readied myself for solat. Then just as I was about to prostrate (sujud), I saw a squiggly red worm near my forehead on the sejadah. I think it was an earthworm, about 6 inches long and half inch thickness. Ah of course I didn't measure it, it was just an approximation. Surprisingly, I kept my cool. I will usually shriek and jump about if I see any worms/maggots/flying cockroaches. But then both Mas and Liza were worst off than me so I had to do the honour. I took a tissue paper and scooped the squiggly worm and put it into the dustbin. I didn't hurt it OK. I told you we were in a basement room – it's the worm's nest we're staying at! That was the ultimate blow out for Mas. She decided there and then we HAD to move out instantly! I resumed my solat on the bed instead, then we were out of there! By this time I think Razeif had already slept like a brick. 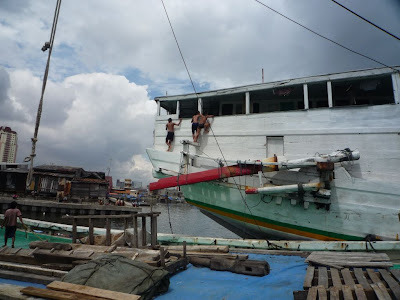 Mas called Pak Dodi, thankfully he was still around the area, menongkrong with his friends. 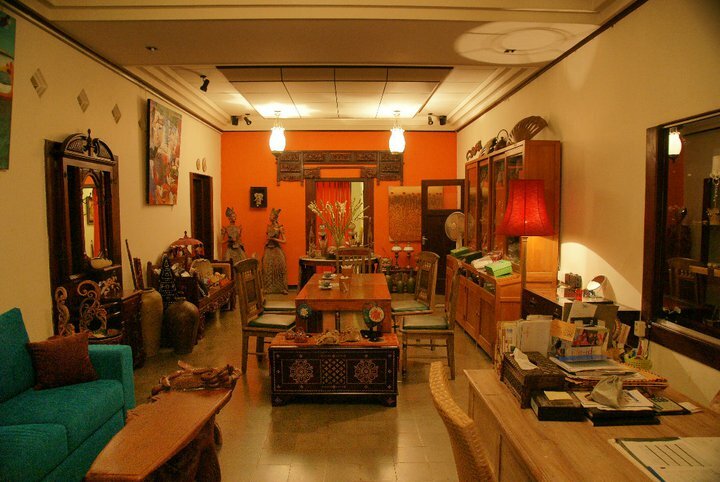 He checked for other hotels for us – and he found Hotel Unik, near to the Kartika Sari cake factory. We checked out of Arwiga (thankfully they didn't charge us for anything) and landed ourselves into the Family Room at Unik which was much more spacious and comfortable. It costs us IDR 428K (or RM 149) for a weekend rate, while the next day would cost us IDR 378K (or RM132) for a weekday rate. 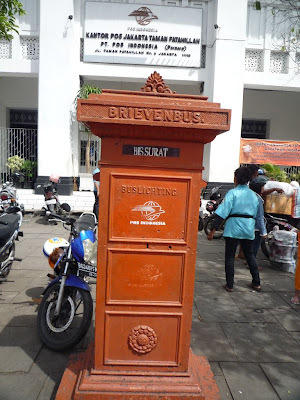 Hallo I liked your blog, I will go to Indonesia for the 8th time in January and will visit Jakarta, Bandung, Jogya, Kediri and Surabaya.I was born in Bandung and live in The Netherlands now.